Why measure the Earth's magnetic field? The aurora disturbs the Earth's magnetic field. If you measure the magnetic field you have a very good indicator of when there is an aurora at your location. I don't want to miss an opportunity to see or to take pictures of the aurora. 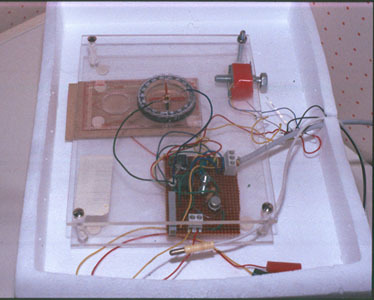 So in 1993 I built myself a magnetometer according to the construction plans by my friend Göte Flodqvist. This magnetometer measures the strength of the horizontal magnetic field and that's also the best indicator of auroral activity. Now that I have the magnetometer I don't have to worry whether there is an aurora going on that I haven't noticed. I can sit at home in my couch or do something else that interests me. The magnetometer will tell me if there is an aurora going on. The magnetometer has developed over the years. In the beginning of 1999 I started to use a computer to log the values. The magnetometer had turned up to be rather dependent on the environment temperature, so by measuring and correcting it in the log program the registrations got better. Particular care should be taken when to find a place where to put a magnetometer in order to avoid disturbances from magnetic objects like cars or other magnetic things. Here below I will put diagrams of interesting day registrations, and comments of auroral activity. The measurements aren't calibrated so if you use them it will be at your responsibility. A X14.1 flare occured at the sun at 13:49 UT and I saw for the first time a CROCHET on my magnetometer. Geomagnetic storm and aurora 21 UT - 01 UT. Watched and shot some pictures. Geomagnetic storm. Almost clear sky here. Could not see any aurora. Probably because of a bright moon and light pollution. 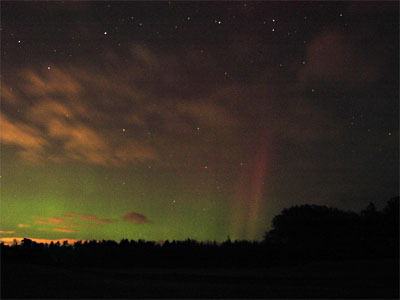 Geomagnetic disturbance and moderate aurora. Watched and tested my new digital camera. Shot some pictures with it and some pictures with my ordinary camera. Severe magnetic storm. Overcast here in Sweden prevented seeing any aurora. Magnetic storm continues. Aurora almost overcast here .Shot some pictures with my digital camera,. A very strong solar wind shock hit the earth just before 02:00 UT. It triggered a world wide aurora display. Probably one of the solar cycle 23 best auroras. Missed it. A strong solar wind shock hit earth just before 6 UT. The earth magnetic field has been very disturbed since then. 16:30 UT the disturbance appear to have come to an end. A coronal hole caused a geomagnetic storm. Overcast here in Sweden prevented seeing any aurora. Geomagnetic storm. Went out in the dark looking for aurora. Did see some very weak rays at 20 UT. A magnetic quiet day measured with my MM placed in the garden for a test. No disturbances from cars and other object in the neighborhood. I have superimposed Lovö's magnetogram for comparison. Geomagnetic storm and aurora. Watched for two hours between 18:30 and 20:30 UT, it was very much moisture in the air. After two hours of watching there was fog. Pictures. Geomagnetic storm and great aurora. Watched the aurora from 18:00 UT to 22:00 UT. Very large display. Shot 2 rolls of film and a lot of digital photos. Geomagnetic storm. Faint aurora shot some digital photos from my front yard. One of them is here. Severe geomagnetic storm. Aurora visible here despite the bright twilight. Shot a few images with my digital camera. One is here. Severe geomagnetic storm caused by a X18 solar flare. Clouds prevented me to see the strong aurora that continued all night long. For a short while there was a hole in the clouds and I could see the aurora overhead. Severe geomagnetic storm caused by a X10 solar flare. Clouds prevented me to see the strong aurora that continued all night long. Probably one of this solar cycle most prominent aurora. Aurora over the hole sky here in Stockholm. Aurora seen as far south as Italy. Shot a lot of photos. Went out and shot some images with my digital camera and analog ones. Cold and windy weather and a nearly full moon did that I went home after only one hour. Overcast here so no aurora images. The severe magnetic storm continues. For a short while there was a hole in the clouds and I could see the aurora overhead. Overcast here in Sweden prevented me from seeing any aurora. A major M5 solar proton flare on 22 of May caused this magnetic storm. Widespread aurora over Australia and North America. No reports from Europa of aurora. A major M1 solar flare on 15 of Mars caused this magnetic storm. Widespread aurora over North America and Scandinavia. Aurora seen over northern part of Europa. An X9.3 flare did occur at the at the sun 12:02 GMT. A Crochet did occur on my magnetometer.